My fascination with mythology started when I received a book of myths as a child, a blue-covered volume with a gray bearded man looking out, eruptions of light etched behind him. Around the same time, I also found a set of action figures – generous marks of my youth – featuring the pantheon of Greek gods. They were superheroes to me, like Thor, with his superhuman strength, speed, and trustworthy hammer. They had gifts and abilities that no mere mortal could possess. Zeus shared a place on my shelf with other plastic replicas of beings from comic book realms. His lightning bolt fit easily in his small toy hand. This was also around the time when Clash of the Titans came out – the first version, of course, featuring Laurence Olivier. The movie featured its own comic book adaptation, firmly cementing the notion that the Greek gods were like those of the DC and Marvel ilk, and the movie featured its own line of action figures. Beyond the obvious example of Thor, other deities that have made their way into the pages of popular comic books are Hercules, Hecate, Athena, Artemis, Neptune, Dionysus, Venus, as well as several others. Amazons and Atlanteans feature in comic books, as do angels and demons. 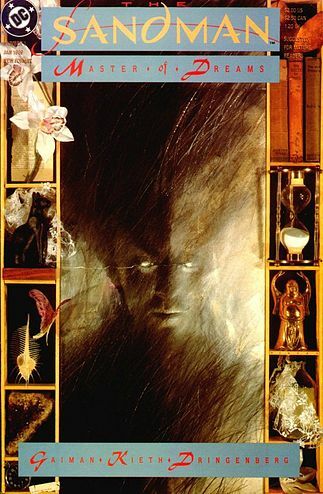 Neil Gaiman’s The Sandman comic series incorporates many of these figures, and even features a character named Lucifer Morningstar. With so many examples, it is obvious that comic books blend the world of superheroes with gods, goddesses, and other cosmological figures. Additionally, the very constitution of a superhero harkens back to mythological figures. These characters are godlike, heroic, otherworldly, and often responsible for more long-lasting events. Often, they represent both the virtues that our society endears, as well as the vices. They can be violent, deranged, or alcoholic. More and more frequently, they seem to return from the dead. Their enemies share many of the same qualities, and the role of superhero and super-villain sometimes blends and reverses. Now, of course, the kids are reading Percy Jackson, weaving ancient myths into a sarcastic present, repurposing old images in a new setting. Mythology is collected as a fragment of young adult literature, but the upshot is that the new generation will have a generous foothold not just on Greek gods, but also Roman and Egyptian stories. When young people read The Odyssey for the first time, they are likely to feel a sense of déjà vu. Ironically, these books are now being adapted into graphic novels. My own search through legend, myth, and theism culminated in my studies as a religion major in college. Gone were the images of colorfully decorated gods swooping down from Olympus to thrash broadly drawn villains, as well as the early sketches and stories I made of superheroes defeating the myths I found in my own life. These pictures were dropped somewhere into long-term memory. As a student of theology, I waded through the genealogies of Old and New Testament, the stories, poems, and parables of Biblical literature. Whether telling a story to explain the presence of a crater, or positing the existence and interactions of a Creator, myths, legends, and parables reveal something of heaven, and of the hand holding the quill. Or pen. Or tapping on the keyboard. One can find these stories in the pages of religious texts and classic literature; the same stories show up in entertainment media, like graphic novels and comic books.